SAORI is a contemporary hand weaving philosophy founded in Japan more than 40 years ago Misao Jo. Since then, the Jo family have committed their lives to sharing SAORI philosophy with others around the world. Misao Jo is now 103 years old and lives in Osaka, Japan with her son, Kenzo Jo. "SAORI" is a compound word expressing its double sources: Misao Jo and Zen philosophy. SAORI means both "Misao's weaving" and "weaving with individual dignity", from the joining of the Japanese word for weaving (ori) with either Misao Jo's name (Mi-sao) or the Zen word for individual dignity (sa). 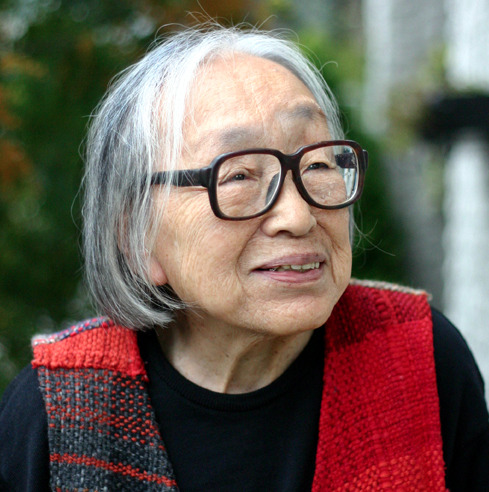 SAORI philosophy offers an open, generous, and spontaneous approach to weaving, emphasizing exploration, improvisation and creative expression. SAORI weaving is a gentle, mindful and meditative creative activity that promotes self-discovery and self-expression. "SAORI” is a trademark of the Sakaiseikisangyou Co, Japan. A philosophy - that all people - regardless of previous experience or perceived artistic ability - have the capacity for artistic expression. We express our humanity in the work of our hands. An outlook - that embraces the natural beauty of unintended effects, irregular edges, and loose threads, and encourages pursuit of the unknown. While weaving we try to stay open-minded and enthusiastic in each moment, alert to our thoughts and emotions, noticing beauty in front of us on the loom and around us as well. Our minds are ready and available. A social movement - bringing diverse people together as a community of learners. It is especially a movement to include within a larger community people who may be isolated or marginalized because of disability, age, income, mental or physical health issues, ethnicity, or other life challenges. All participants are encouraged to share their discoveries with others - a new weaver can generate unique ideas, a child can demonstrate a new technique to an adult, and a person with disabilities can coach others. We weave and learn together as equals. A creative and practical path - of personal discovery and development, meditation, stress reduction, therapy, rehabilitation, trauma recovery, identity-building, community-building, and economic self-reliance. We can express ourselves fully. SAORI weaving is practiced by hand-weavers, artists, textile and fashion designers, children and adults, older adults, corporate executives, and the disabled. SAORI is practiced in schools and special education programs, in adult education programs and community centers, in corporate team-building programs and in meditation centers. SAORI weavers learn skills that promote confidence and joyful self-expression. SAORI is practiced in therapeutic environments worldwide, including Asia, Europe and North America, including hospital and rehabilitation centers for people with disabilities. SAORI weaving equipment includes accessories specifically designed to allow people with physical disabilities to weave independently or with minimal assistance. SAORI weaving contributes to improved motor skills, self-direction and social interaction skills. SAORI is practiced by anyone wanting to experience SAORI's unique and effective philosophy and tools, or who wants to participate in a supportive studio community. SAORI is a global network of authorized teachers, studios, and product dealers. Ready to Hand: SAORI Philadelphia is the authorized teaching studio and dealer of SAORI products in the greater Philadelphia area. How is SAORI different from traditional weaving? SAORI's philosophy is uniquely complemented by its looms and related weaving equipment. SAORI floor looms are exceptionally easy to use, and include an integrated bobbin winder and tool shelf. Weaving on traditional floor looms requires significant knowledge and skill in winding warps and dressing the loom. By contrast, SAORI offers pre-wound warps and warping tools that simplify preparing the loom for weaving until weavers chooses to learn additional warping skills for even more creative opportunities. Why does SAORI clothing look so unique and beautiful? SAORI-woven cloth is hand-woven moment by moment, and every thread is chosen and woven by a person whose heart and mind are actively engaged in the activity. This creates a foundation - inch by inch - for unique cloth and unique clothes. In addition, SAORI prizes avoidance of waste in making garments by creative use of all the woven cloth. SAORI garment construction techniques draw on both the simplicity of traditional Japanese kimono and the creative structures of origami (think Issey Miyake! ), minimizing cutting and waste, and inviting creative draping. Additional information about SAORI weaving is in Misao Jo's book SAORI: Self-Innovation Through Free Weaving (2012). Contact us to obtain a copy or check our Shop page. "Weaving community together one neighbor at a time"